Telestrations is a game that can be ridiculous amounts of fun with a big enough group but suffers ever more the fewer people you have. We gave it four stars in our review as a kind of informal average – my own experiences with the game would have nudged it a little lower were it not for the fact that I watched how unremittingly popular it became at the RGU Game Nights I arranged last year. It was such a big hit that we went through multiple sets of pens. Occasionally you wouldn’t be able to hear much else except from the laughter at the Telestrations table. Your mileage is going to vary though, and the smaller your group the less likely you’ll really squeeze the juice from the experience. Regardless, it’s a game that is very intuitive and as we said in the review ‘a damn near perfect game’ when played in the right circumstances. What might those circumstances be? Let’s find out. My word is teardown – what can we possibly draw from that? Colour isn’t a major channel of information. The spirals of the pads are colour coded, but you rarely need to know whose book you’re working with and in cases where you do it’ll be written prominently on the front. While the spirals don’t differentiate well it doesn’t actually matter at all. There are no circumstances I can envisage where you’d need to tell one pad from another by their colour. 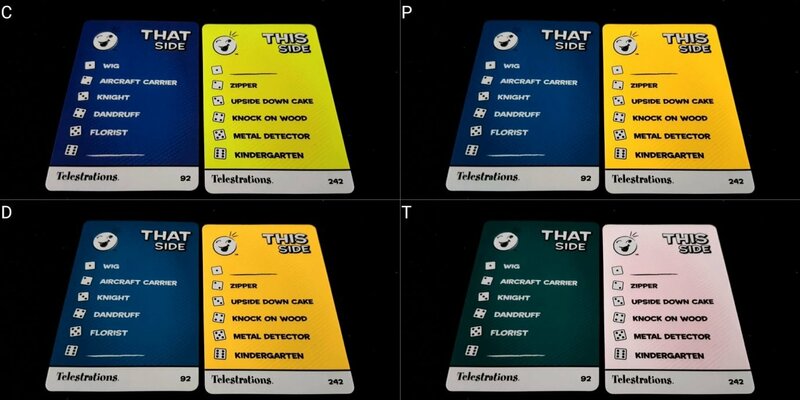 The cards are presented in blue and yellow, and even if this was meaningful information all it does is identify ‘this side’ versus ‘that side’. In any case, that’s marked prominently on the cards themselves. While you’ll be drawing a lot during Telestrations, you’re given only a black pen with which to do it. Drawings then are monochrome unless you decide to bling out your game with a whole set of different coloured pens – in that case, whatever colour problems you introduce are entirely of your own doing. We strongly recommend Telestrations in this category. Telestrations is a game that I don’t think could at all be played by those with total blindness. While the cards you use for picking words could be replaced with some other system (text to speech using a dictionary as a simple example) you’re still going to be reading and interpreting and drawing words as they come to you from other players and on the basis of profoundly imperfect information. I don’t see a way at all this could be played by players with no ability to discriminate some degree of visual information but as usual I’m thoroughly prepared for someone to prove me wrong on that. For those with less severe visual impairments, well – it depends. Mostly what you’ll be doing is checking a pad that is directly in front of you and so it will yield itself to close inspection if necessary. However, the information you’re inspecting is unlikely to be particularly accessible since it’s being scrawled by other players, often in a hurry, and often with no clear idea of what they’re doing. As such you’ll often be trying to interpret a weird, poorly drawn image and then writing down what you think it means. Or you’ll be dealing with poor hand-writing and trying to parse it into something that can be drawn. Questron? One of my favourite SSI games. Ordinarily this would be enough for us to advise players with visual impairment stay well away from Telestrations. The thing is – this isn’t a game about getting any of this right, and getting it wrong is actually the best thing you can do from round to round. The funny here is in credibly getting things wrong, and for people to run with that to make things increasingly wronger. As such, this might just be a drawing game that could work for those with visual impairments provided they can read a few words at a time and then turn those into clumsy drawings. Really, the clumsier the better. However, the payload of the fun in the game is to be found in the revelation of failure – by flipping through each of the books in turn to reveal what went wrong. That’s going to be more difficult to do in a meaningful sense if one, or more, of the players involved have a visual impairment. This process usually takes the form of a kind of ‘show and tell’ where everyone flips through their pad and shows it off to the table. Close inspection here is possible but will have a major impact on the speed and convenience with which players can join in on the fun. 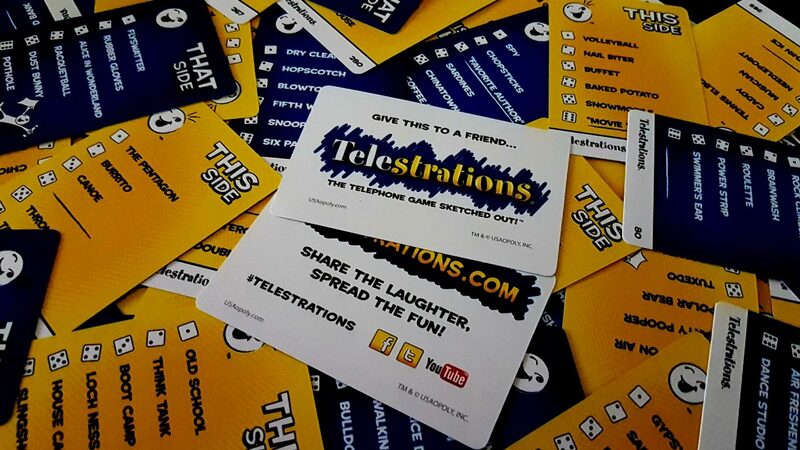 Telestrations then is a game that has a slightly odd structure – those with visual impairments can likely play, but they might have to miss out on the fun to a significant extent. Even the simple logistics of examining each pad with an assistive aid is going to dull the comedy – most jokes don’t stand up to close inspection after all. Timing is the essence of comedy, and here that timing is likely to be lost. As a result, we don’t recommend Telestrations in this category although I could believe the game would be better for everyone else at element with one or more wildcard elements throwing an increased variety of interpretation into play. Almost all of the things that would normally be an issue here are pretty much dealt with in the design. The only problem is that there is a degree of general knowledge required of the cards, and of the interpretations people make of drawings. This general knowledge includes a requirement to understand idioms, geography, flora and fauna, occupations, mythology and more. You might be asked to draw ‘Rhode Island’ or ‘The Mona Lisa’ or ‘Last Straw’. A lot of the cards are very US-centric, although not so much that they’re likely to cause too much confusion. I’m not sure though how I’d draw ‘New Jersey’ or the ‘Florida Keys’. I’m not sure what a ‘sugar cookie’ is and how it differs from a normal biscuit. But you can avoid even this problem by letting people simply pick a word such as is the case with many similar kinds of parlour games such as Eat Poop You Cat. Charades doesn’t require a stack of cards, and Pictionary likewise can be played by simply drawing player-sourced words from a hat. If the general knowledge required of the cards is likely to be a problem, you can arrange for a much more tailored experience albeit with a greatly increased setup cost. Most of the cards have a ‘blank’ option on them anyway – all you’d be doing is making that the default instead of something dependant on a die roll. You could even mix and match – roll the die for inspiration and let people pick whatever they like. However, even in this there is a degree of literacy required of players, but by common agreement the level can be decided upon by the table. A large or flexible vocabulary is not needed to be funny – simple compounds can be as good here as more complex words. Guessing ‘aardvark’ might be the most precise interpretation you can come up with, but it’s still not going to be as funny as ‘dog with snake nose’. Beyond this, the game is perhaps ideal for players with cognitive impairments. The only requirement for memory is knowing what the last picture or word is, and it’s available by flipping back a page in the pad. I won’t go so far as to say it’s a game that doesn’t require any drawing or literacy skill but it’s certainly a game that gets better the less skill everyone has. The act of inaccurately interpreting a picture or a word is what the game depends upon. It’s also a game where the very concept of winning is antithetical to the design – the goal is to have fun, not to compete. As such, it doesn’t matter if one player is ‘better’ or ‘worse’ than another. Game flow is reliable – ‘draw, then pass, interpret, then pass, repeat until your pad comes back to you’. That happens at the same time for everyone, and everyone is going to be on the same stage of the game as everyone else. As such, nobody even has to remember what stage they’re on – the table as a whole will be a guide to that. Instructions for the current round are presented to each player on the pad of which they take possession, and everything about the design of the pad points the player to what they should be doing. We’ll recommend Telestrations in the fluid intelligence category, and strongly recommend it in the memory category. The literacy requirement is difficult to get around given the nature of the game, and as such we can’t be as effusive as we would like. It’s otherwise pretty much as accessible in this category as is possible though in both components and game design. 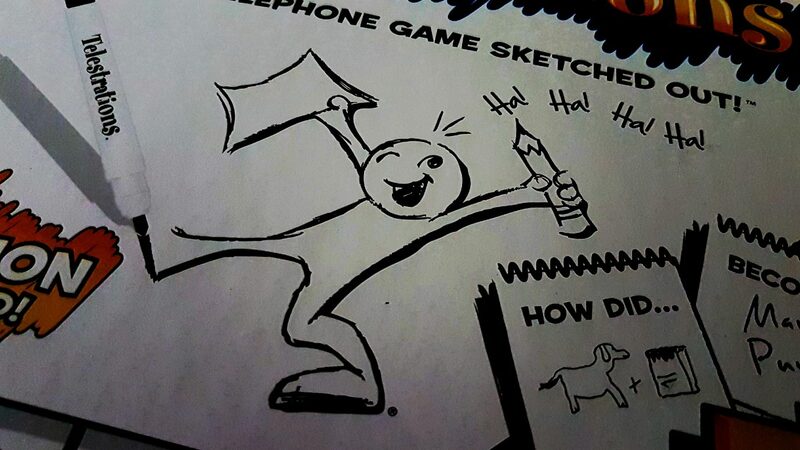 Pictionary may be a rage-generating monster but Telestrations absolutely isn’t. You’re supposed to get things wrong, and the more wrong you are the better it is for everyone. There’s no ganging up on other players, no meaningful challenge given how there’s no expectation of success, and no scoring in the standard game. Really this is about as emotionally accessible a game as I can imagine – it’s not even a game in its strictest sense. It’s an activity. Even the way in which it shines the light of comedy at mistakes is done in the most wholesome possible way. Everyone shares a responsibility in whatever nonsense emerges at the end – everyone either interpreted a drawing or provided one of their own. Every player interacts with every pad. As such, even if there was a competitive element you couldn’t point to a single player as being the reason it all fell apart. You’re all members of the same team in the end – team screwup. It would need to be done in a way that didn’t give away any hints – not ‘draw a face’ but rather draw geometric shapes and arcs. You could certainly do it – ‘start at the top left of the page, draw a curve bowing outwards about two inches, then another…’. It would be cumbersome, but it doesn’t matter that what emerges is a good reflection of what you have in mind. It would be much better to draw directly of course, and I don’t think this would be a good compensation. It’s feasible though, even if it’s not optimal. The pens you use in Telestrations are not precise instruments, although if necessary they could be replaced with higher quality markers. The constraints within which you draw are very limited because the pads are not large. Flipping over from one page to another works via spiral binding, but the give here is generous – it’s not like trying to wrestle with a recalcitrant notebook. 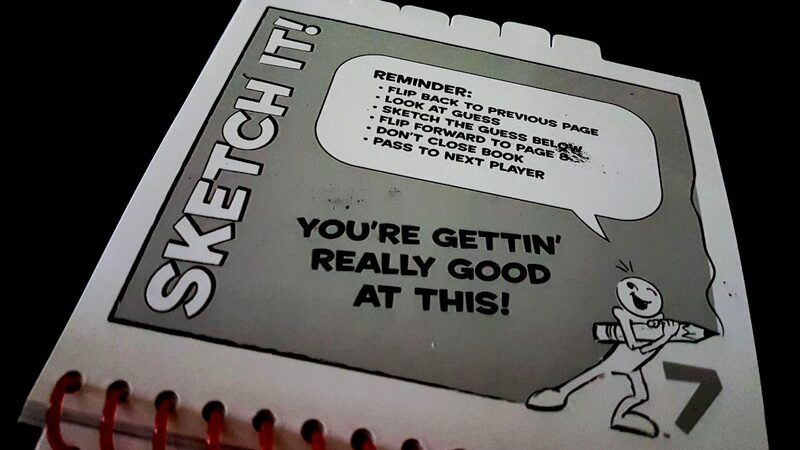 Strictly speaking, you could even play this with a standard pad of paper and normal pencils. It wouldn’t be quite so well designed in terms of having the tabs along the bottom for easily flipping back and forward, but it would be workable. The aforementioned Eat Poop You Cat works by folding over the top of a piece of paper each time it’s passed on. If it’s the degree of movement that is the problem, rather than the type, you could compensate for it with a visit to a local stationer. So, some fine grained movement is needed here – you need to be able to hold a pen or pencil and draw, but you could substitute out components to a degree to facilitate this. You’d also need to be able to write semi-legibly (again, it’s not about accuracy here – it’s about the comedy of failure) and draw simple shapes. If that’s possible, Telestrations perhaps is worth considering. A competitive model of play, or a game design that stressed skill as opposed to comedy, would not come close to a recommendation here. We’ll just offer a very tentative recommendation if and only if some degree of ability to draw is possible. Otherwise the extra work required to support play will likely kill the fun. The character on the cover is not gendered, and the manual makes use of the second person perspective when explaining game rule systems. The cards in the game are many and varied, but I didn’t see any potentially troublesome content. Wholesome through and through, really. There’s an ‘after dark’ version that would likely be more interesting to talk about here but I don’t have that one to compare, and in any case would have no bearing on this particular box. The game has an RRP of around £35, and it supports between four and eight players. Except really it supports between five and eight, and is only really good at six and above. 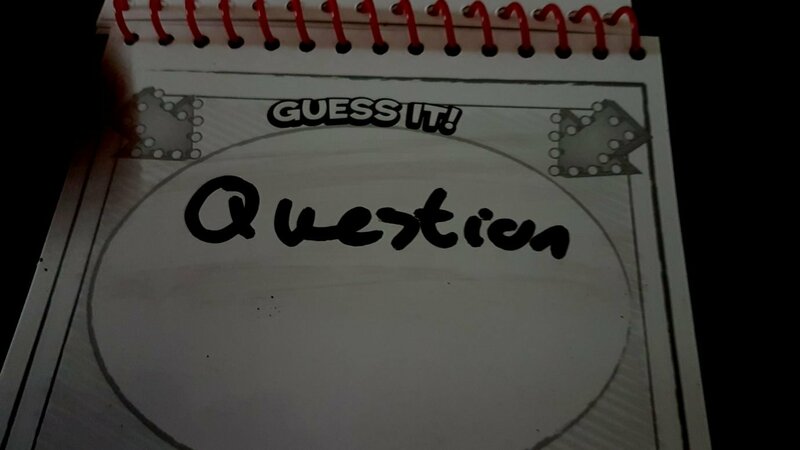 In terms of sheer applicability though it’s hard to fault – even something like Codenames has a greater barrier to entry than Telestrations, and that comes with the additional cost of turning vibrant discussion into cold, sterile, silent pondering. Telestrations is a riot of ‘Oh god why’ and ‘What on Earth?’ and ‘I don’t even know what to do with this’ and while you’re focused on your own pad you’re immersed in the murmuring of everyone else. It’s a very social game, which is exactly what you’d want for the player counts at which it thrives. If you need a larger player count you can pick up the twelve player party count edition instead. We’ll recommend Telestrations in this category – its poor showing at lower player counts is a problem, but there are few things I’d recommend more at six and above for a group that might not be made up of entirely hard-core gamers. A degree of literacy is required but the extent to which it is needed is malleable. 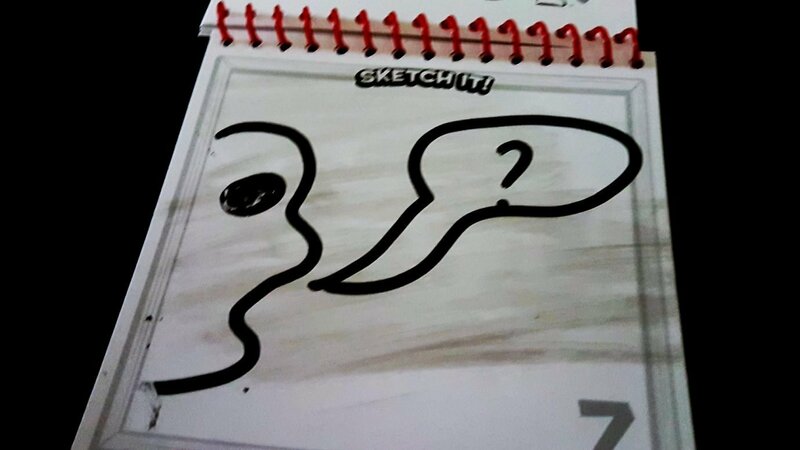 Players can simply decide on their own words from which to begin drawing. It’s possible in a mixed language group that one player may not have the perfect word to represent what they want to say about a drawing, but the imperfect will be as good, if not better. However, it’ll still be necessary to read the words other people write and that might be a little more complex. Still, the same rule applies – you’ll get as much fun out of misinterpreting a word and drawing it perfectly as you will from interpreting it and drawing it badly. Other than this, communication is not at all required. We’ll recommend Telestrations in this category. We’ve offered a (very) tentative recommendation for Telestrations in the physical accessibility category, and unusually that doesn’t really change depending on other intersections of accessibility requirements. Telestrations gets a free pass on a lot of things because it works best when people don’t achieve what they intend and that’s an aid to participation across the board. Literally the only reason it’s not flashing green in every system is that you do need to be able to see things, and draw things. As long as an intersection doesn’t impact on that, the game is as good if not better. But it’s important here to make a point that this by itself isn’t enough – the whole tone and style of Telestrations is key to that being a good thing in the teardown. It’s possible for a game to become funnier because of impairment but for that to be a terrible problem – it’s the difference here between laughing at and laughing with. Here it’s not funny because you did something poorly – it’s funny because everyone did something poorly and it compounded again and again into something ridiculous. It’s not ‘lol, impairments make this funnier’. It’s that the manifestations of impair align almost perfectly with the optimal playing of the game. It’s not gallows humour– it’s exactly the same comedy as the game is designed to elicit. A dexterity game might well be funnier, for certain groups, if visual and physical impairments work together to make someone constantly hit the wrong targets or inflict damage upon their own team. That though is not the kind of comedy outcome we’d endorse here because it’s counter to the design intentions of the game. In that scenario, the funny is because of impairment– it’s ableist comedy. Here, with Telestrations, it all aligns beautifully because iompairment is largely an independent quality of the comedy. If anything, it just lets players optimally capture the best of what it’s possible to get out of the game. Individual rounds of Telestration are reasonably quick – you’ll play several rounds in a full game, and the number of rounds you have is entirely up to the discretion of the table. Play until you get bored, essentially. However, the more players you have the longer a round will be and you’re always going to want greater, rather than fewer, players. Assume perhaps a minute per player per round and you’ll be in approximately the right ballpark. Adjust that as necessary for accessibility compensations. Telestrations doesn’t support gracefully dropping out during a round – everyone needs to see it through to the end. Provided you have enough players to retain the fun it permits players to drop out between rounds with no impact – especially if you’re not keeping score. Only two things are really needed of those playing Telestrations – the ability to make marks upon a pad, and the ability to see what others have drawn. Everything else is, if not optional, at least configurable. It’s a good-natured exercise in collaboratively screwing up and it’s remarkable how significantly that lowers the barrier to meaningful participation. Even in those categories that received the lowest recommendations there’s a degree of hedging. Swapping out components would go a long way to working beyond the constraints of the game. 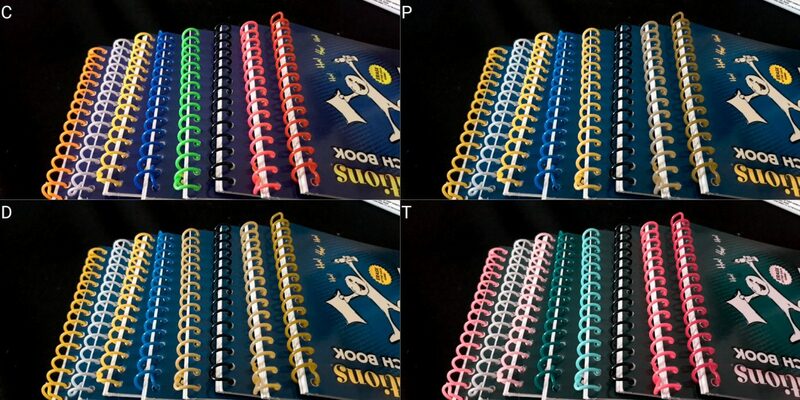 It’s something that, if you had access to a handful of notebooks, you could put together using household components. That means it lends itself well to home-brewing accessible versions – write big, draw big. I’m not sure there’s a drawing game that we could unambiguously recommend in the visual and physical accessibility categories, but Telestrations is certainly as close as we’ve ever seen both within the site and beyond. We gave Telestrations four stars in our review, but with a big enough group it’s even better than that generous rating might imply. It’s even something that we can largely recommend as an accessible prospect, even if that’s not entirely across the board. Telestrations is a game about getting things wrong and having a laugh about it. If it’s possible to make out some drawings and apply a pen to a pad you’ll almost certainly be able to play it and a have a good deal of fun in the process.